In one of our most heart-warming winner stories to date, two close friends working together in a West Yorkshire Post Office will share our biggest cash prize! The publicity-shy duo scanned the winning Health Lottery ticket, and won £250,000 in our January 2019 Mega Raffle. In a touching interview, both winners affirmed that they will give all the money to their children. “We love our children dearly, and nothing makes us happier than to see them happy,” they said. To date, £9.6 million has been raised through ticket sales in the Yorkshire and Humber region, supporting over 300 local community projects. The duo insisted they will continue to play The Health Lottery as it helps to fund charities in their local area, which they think is a great way to give back. The duo’s win marks the first Mega Raffle of 2019. Throughout the year, there will be another 11 guaranteed winners – each of whom will bag that £250,000 prize! 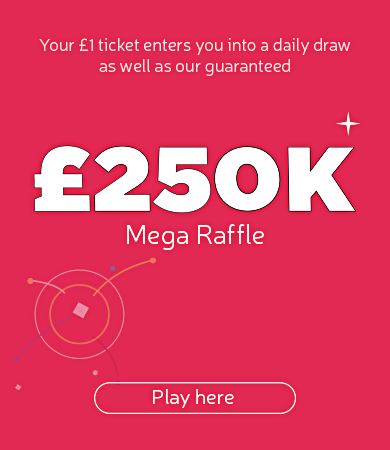 The next Mega Raffle will be drawn on Friday 1st February. All £1 tickets purchased for a January draw, before 7:45pm on Thursday 31st January, will earn one automatic entry into this Mega Raffle.